Athletes for each sport will pay a "Pay-To-Play" fee at the beginning of the year to pay for referees, uniforms, tournaments, balls, and other misc. expenses (with the exception of soccer and tennis). Practices are after school unless noted. 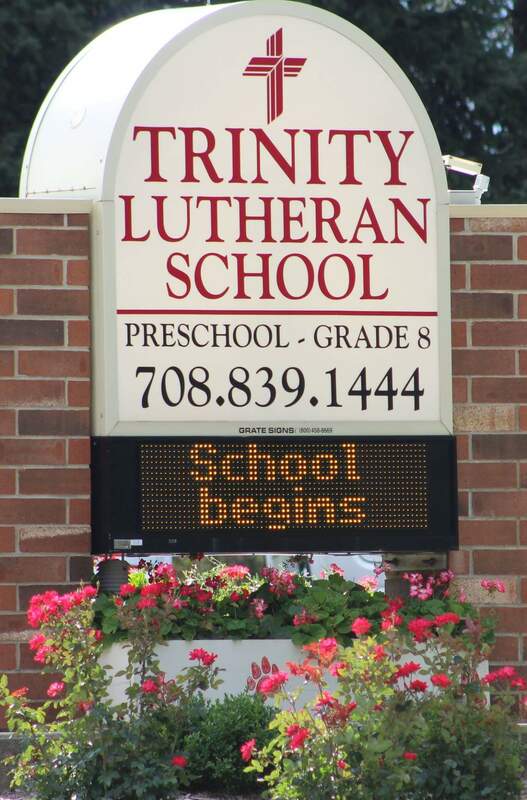 The students at Trinity have daily recess and physical education throughout the week. In addition to recess and gym, Trinity offers a competitive sports program. Trinity has a no-cut policy and everyone who signs up will get play time, depending on academic eligibility. Including all of our students, builds confidence for high school sports. We have 2 levels of co-ed basketball. Fourth - sixth graders compete at the Junior Varsity (JV) level. The Varsity level is geared toward seventh and eight, but younger grades are added as needed to fill the roster. We are part of the West Suburban Lutheran Athletics Conference. The Varsity team plays 1-2 tournaments. Students in fifth-eighth grade can participate in our co-ed volleyball program. We are part of the West Suburban Lutheran Athletics Conference. The team plays 1-2 tournaments, as Trinity hosts a volleyball tournament in September. See Lisa Haak, our Athletics Director, to volunteer. Fifth - eighth grade runners participate in 2-3 meets in the fall. Runners in 5-6 grades run 1 mile races. The 7-8 graders run 1-2 miles depending on the meet. The season runs through early October. Fifth - eight graders participate in track and field events. Practices occur mainly in P.E. classes during the school day, but may use after school as needed. We compete at a meet at Concordia University in May, though other meets may happen by invitation. Some athletes may qualify for the State Meet. Wednesdays, 11:30-12:05 (PS-K) Sept. 5 -Oct 21, $110/session + $20 annual registration fee (includes Adidas jersey) Register online at www.soccershots.org/sdupage for all sessions. Do you want your child to engage in physical activity in a positive environment where encouragement is non-stop, acheivements are celebrated and confidence is built? If so, we invite you to experience Soccer Shots, an after school enrichment program for PS-Kindergarten students! Our curriculum focuses on fun, skill building and character development rather than competition. Fall, winter and spring sessions; each session is 8 weeks and $110. No experience or apparel needed. Find out more and register at www.soccershots.org/sdupage or call 331-725-PLAY.